Home / The 2018 Worlds, the final day. The 2018 Worlds, the final day. ‘The odd thing is, it’s not usually like this here...’ How often do you hear that at a regatta from the locals eh? 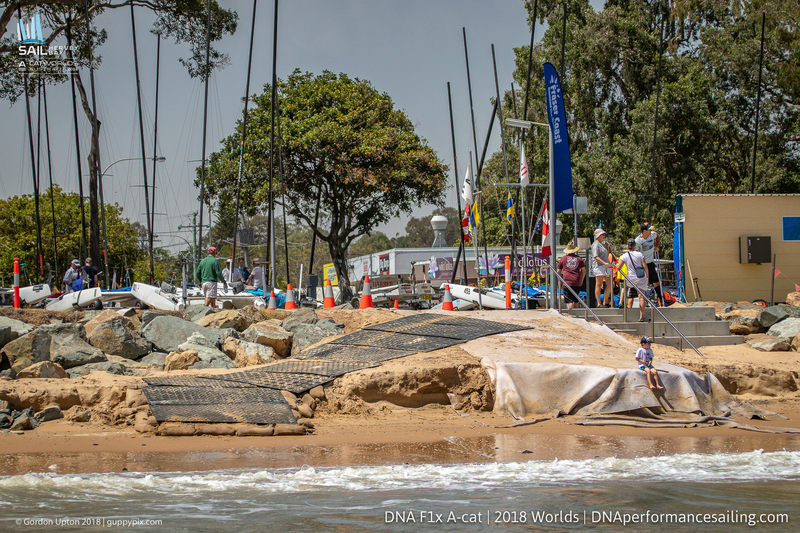 After losing two more days of sailing at the ‘A’ Cat Worlds in Hervey Bay on the lovely Fraser Coast, this time due to Northerly winds making it too unsafe to launch the rescue boats ect into the ‘Texel’ style breakers. Even though they had officially got a championship after they had sailed 6 races for the series, the race committee, acknowledging the fact many had travelled tens of thousands of miles to be there, finally managed to get in three races more on the last scheduled day of the event. And what races they were too! The day started pretty calm, and with forecast 6-8 kt winds. The media boat zipped of to a nearby beauty spot, called with the typical no nonsense Australian parlance, Pelican Banks. Essentially a sandbank with pelicans on and reminiscent of a cartoon desert island minus that single palm tree, to do an interview about the upcoming day and including a subsequently erroneous weather forecast. The start was delayed and hour or so, as the previous two days of onshore wind and associated waves had virtually removed the launching ramps onto the beach and turning them into little 2ft cliffs. But the organizers had quickly managed to mobilize some real engineers and all the bush engineers from amongst the sailors, together with volunteers and some local council guys to construct a new launch ramp to access the beach. The Classics were first away, after a General Recall mainly due to the tide flow, and with the wind a nice 7-9 kts. Fleet overnight leader, ahead with a 7pt cushion, Andrew Landenberger (AUS 908) wasted no time in drawing ahead of Scott Anderson (AUS 31) with Alberto Farnassi (SWE 59) and the others following on to the left of the course towards the shore. But as the race progressed the wind slowly started to increase up a notch. Landy won his 6thbullet and Scotty his 4thsecond. Alberto was beaten by Graeme Parker (AUS 967) and Landy’s son, Andy Landenberger (AUS 300) – a name to watch for the future. Over on the Open fleet, also after a General Recall and then a black flag that saw Joseph Randall (AUS 1014) and Todd Woods (CAN 66) getting DSQ. 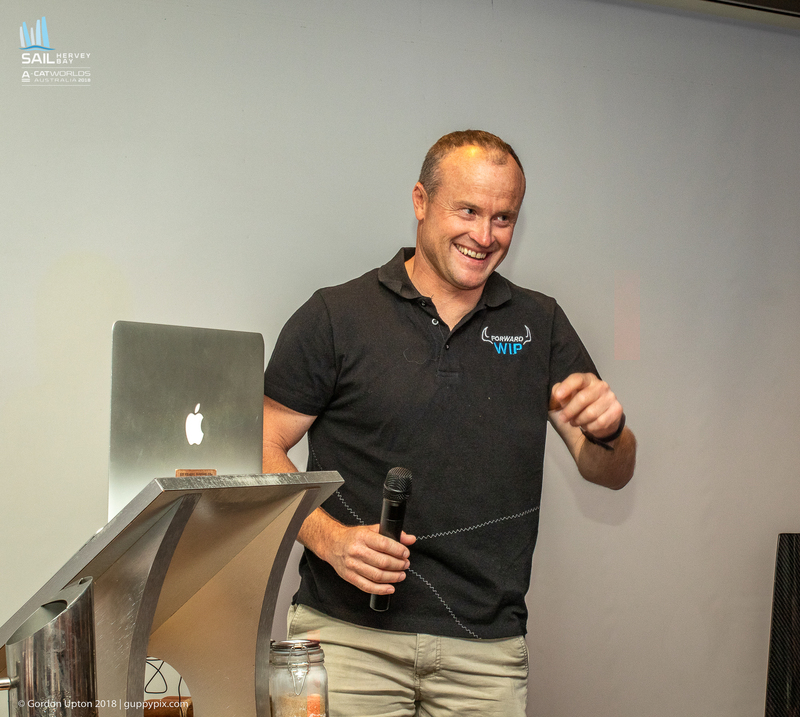 Tom Bojland (DEN 77) was rammed from behind resulting is his tiller bar breaking and causing him to turn, upon which he was then rammed in the side. The unhappy Dane was awarded average points for the last three races after the protest making him 33rd. 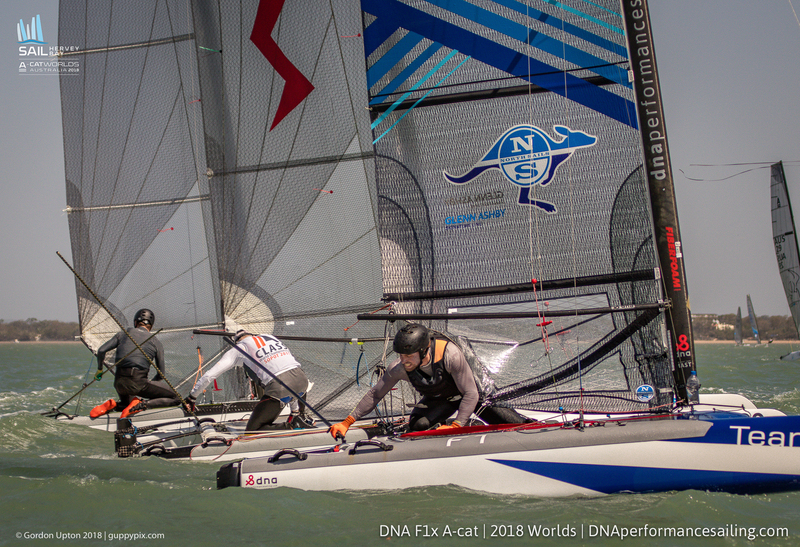 Unaware or unconcerned by all this drama, NTNZ helm Peter Burling (NZL 7) blasted around the top mark ahead of Micha Heemskerk (NED 7), followed a minute later by series leader Glenn Ashby (AUS 111). Glenn had a 5pt lead from Mischa going into the race, so couldn’t let up the pace. 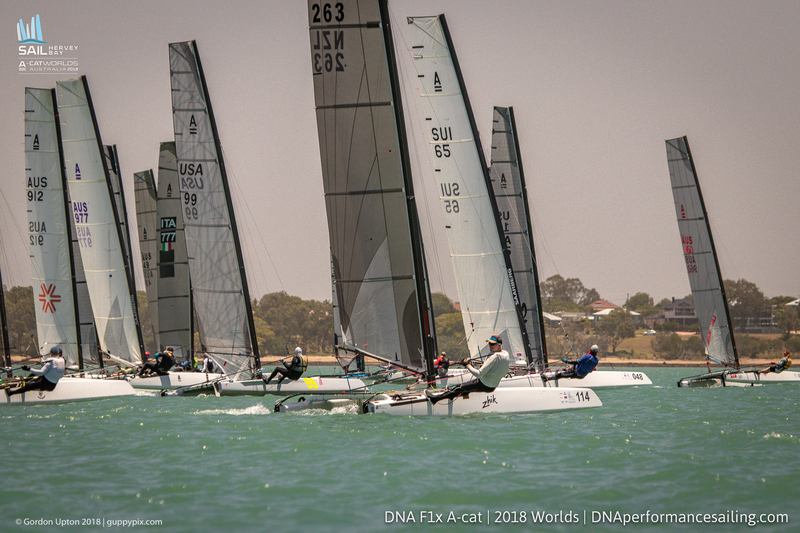 By the second lap the trip had been joined by Bruce Mahoney (USA 311) in his highest position of the series so far, and this was how the finish positions were as Burling, clearly getting to grips with his boat and their new larger rudder winglets and started sailing like a monster. Glenn in 3rd, then sailed straight over to his support boat and capsized. He’d had a board raking issue that took nearly all the time until the second start to fix. As other boats finished, their personal battles gained them or lost them valuable last day points. Race two started in an increased 12-14 kt wind. 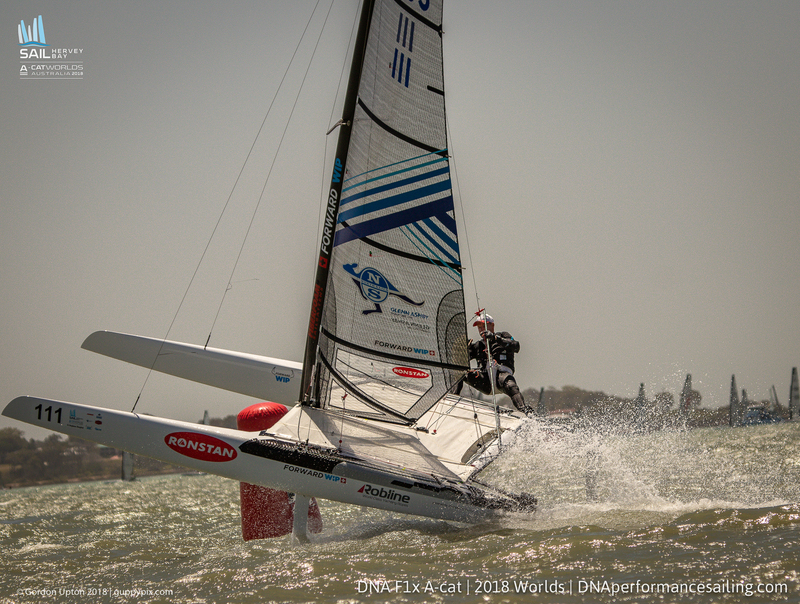 And this was the moment that young Kiwi Micha Wilkinson (NZL 96) made the ballsiest move seen in the whole regatta. He did a magnificent port flyer, from the pin end, right across the bows of all the America’s Cup and Olympic superstars, probably something he will wake up a 3am in a cold sweat thinking about later, but a magnificent thing to behold. It got him his best finish of 9thas a result. At the line, Glenn was 2 mins ahead of Burling this time. 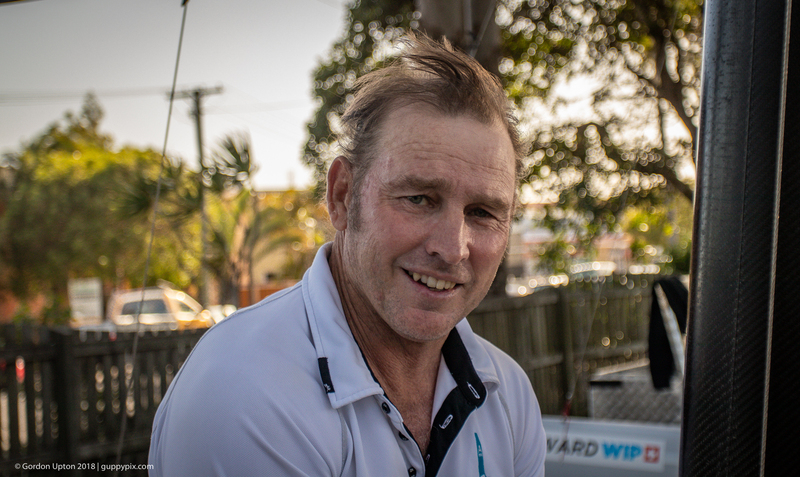 Behind him was another ETNZ sailor Blair Tuke (NZL 777) who had regained his earlier week form. 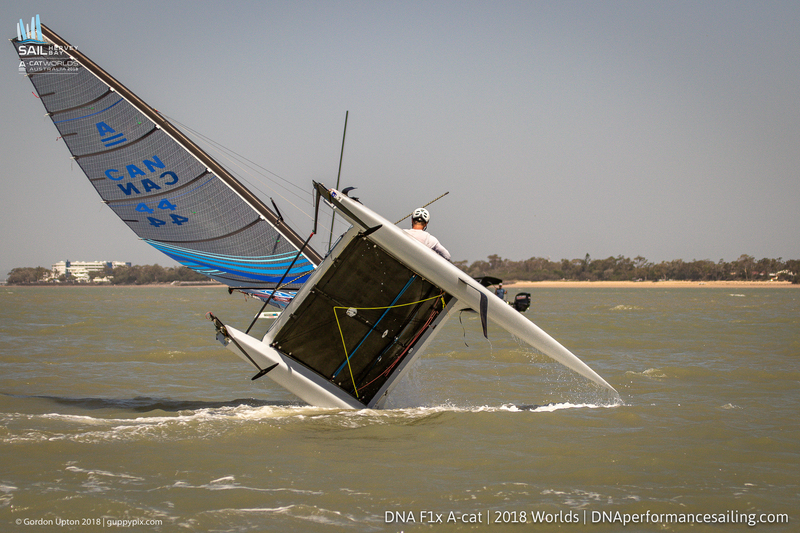 Darren Bundock (AUS 88) finished just ahead of Mischa this time and closely followed the Adam Beattie (AUS 14) in his best regatta finish of 6th. A little further back Tom Johnson (AUS 1065) was closing in on the line after fighting to get past Stevie Brewin (AUS 4) and Bruce, had a lovely little ‘crown pleaser of a capsize on his final fast gybe, 200 yrds from the line allowing the others to slip past again. His displeasure was probably heard ashore. 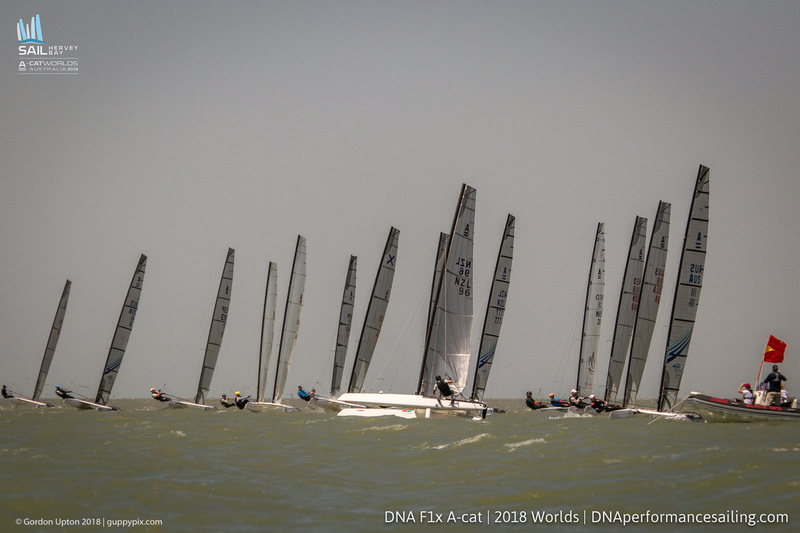 So, came the final race of the 2018 Worlds. Glenn lead Mischa by more comfortable 9 points. But still needed to stay on the dry side of the boat and finish in the top 9 boats, so still couldn’t drop his guard. By now, the wind had gone up again, 15 – 19kts now. Rather more than the pelicans on their bank been forecasting, and many boats had a lighter wind setup, such as less mast rake, so may have been powered up more than their sailors were. At the first bottom mark, Glenn, who reached that in 14 mins, blasted around in the blustery conditions, but his boat had a little leap as he hardened up onto his upwing leg. But lap two he had lapped possibly 25% of the fleet, chased by Burling and Tuke with Mischa chasing hard in 4th. By the finish, he’d lapped most of the fleet to cross the line and perform his traditional hull flying victory dance. Burling and Tuke arrived a few minutes later, trailed by Mischa. As the rest of the fleet arrived, tired sailors flipped boats on gybes, others in the groups of 2 or 3 fought hard to arrive overlapped and foiling over the line, all glad to have taken part. And, as usual, the said back to the beach was even better. No least for some of the Classics, as they arrived from their further upwind race area. This, of course gave Landy and chance to show he was at least as fast downhill as many of the foilers, something he did with his characteristic big grin. To sum up – this has been one of the classic ‘A’ Cat World Championships. Although half of the days were unsailable due to too much/too little wind and the associated water states, is was hugely enjoyable for all. 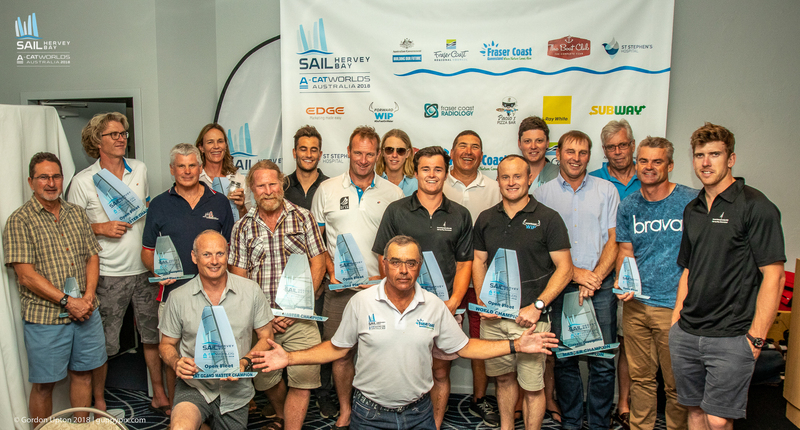 Yes, a few things got broken, but it was a hard fought Worlds in a cutting edge boat after all, and with the strongest fleet seen in many years by some margin. In the end, two characters dominated as we all expected. Landy in the Classic division, Glenn in the Open, but neither had it their own way all the time, no walk in the park for them. They had to fight this time to be the World Champions, and the class is all the better for that. Now the circus moves on, next year to the slightly less warm, but definitely less turtle or shark infested seas of the Weymouth and Portland National Sailing Academy. 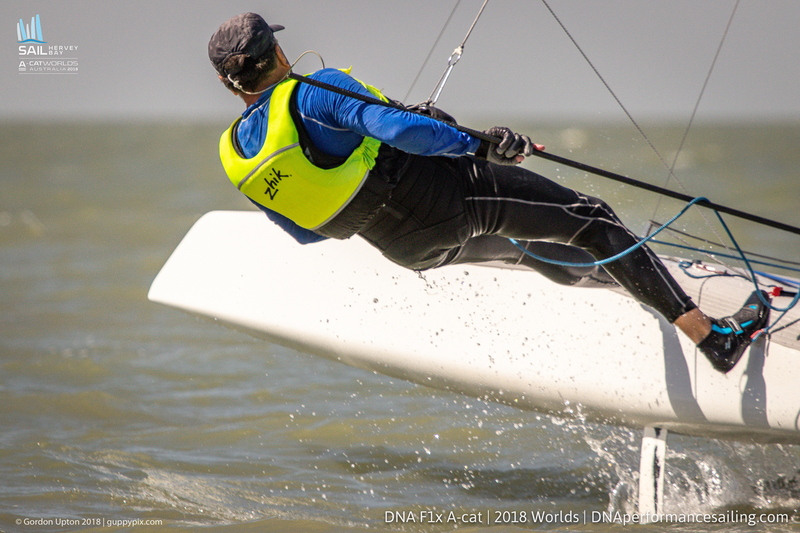 And many Open division sailors here this year, have realized that the foiling nirvana of Portland Harbour, with it’s smooth winds and flat water is what awaits them. Just pack those 3mm wetsuits guys and you’ll all be fine!